The workshop discussed the 15 research proposals submitted by 11 participating institutes from CAREC countries. Senior government officials of the eight CAREC countries were trained in five key areas: leadership, public sector management, strategic thinking and planning, public sector finance, and negotiation and persuasion. 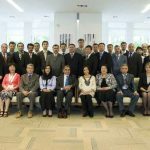 The CAREC Institute Small Research Grants Program aims to encourage research by local researchers and institutes that will advance regional economic cooperation in the priority areas of transport, energy, and trade; and will support interaction among researchers and development of research networks in CAREC participating countries. The CAREC Institute Research Program 2009-2011 will explore fundamental questions in five areas critical to supporting and deepening regional economic cooperation among CAREC countries.